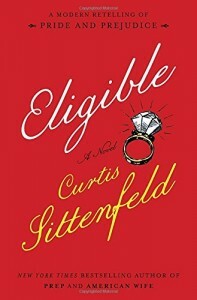 As guilty pleasures go, Curtis Sittenfeld’s update on Pride & Prejudice takes some beating. Among the other contenders in the Austen Project (‘ a major series in which six contemporary authors including Joanna Trollope, Val McDermid and Alexander McCall Smith reimagine the six complete novels of Jane Austen’) Sittenfeld and McDermid seem to be making the best job of a questionable enterprise. While the timeless perfection of the original creates the rock-solid foundation for Eligible, this modern version of the Bennet family story, set in Cincinnati, is a clever and diverting revision, substituting CrossFit training, IVF and reality television shows for Austen’s periodisms. Indeed one dimension of Eligible’s charm is in observing Sittenfeld’s choices of contemporary tropes, alongside what she chose to jettison in the cause of twenty-first century plausibility. No longer does Darcy dash off to salvage Lydia’s good name, however he does restore family unity by using his medical knowledge (he’s a brain surgeon) to convince a rather less likeable modern-day Mrs Bennet that a transgender husband may yet be acceptable for one of her daughters. 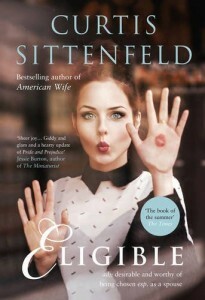 Darcy’s sister Georgie, whose role has been diminished, has not been seduced by Wickham (journalist Jasper Wick in Sittenfeld’s tale) however is suffering from anorexia. Most striking, probably, is Liz/Elizabeth’s final decisive act when, subsuming her prejudice and overlooking Darcy’s pride, she proposes to him. While critics have pointed out Sittenfeld’s failure to modernize Austen’s larger satire on wealth, there’s still plenty of attention here to money, snobbery and prejudice of many kinds (racial, sexual, class). Best of all this book is fast, funny and very tidily crafted. Many Austen fans will naturally feel protective towards the undimmed brilliance of the original, but this new facsimile does a good job of adding fresh layers of compulsion to one of the most re-readable novels in the English canon.